I’ve had a good bit of knitting time this week as I cope with this illness. Between naps and blood draws, I’m basically fighting to get my work done and then napping more or knitting. Knitting is a lot slower than sewing, but I was able to finish this hat in just a few days. 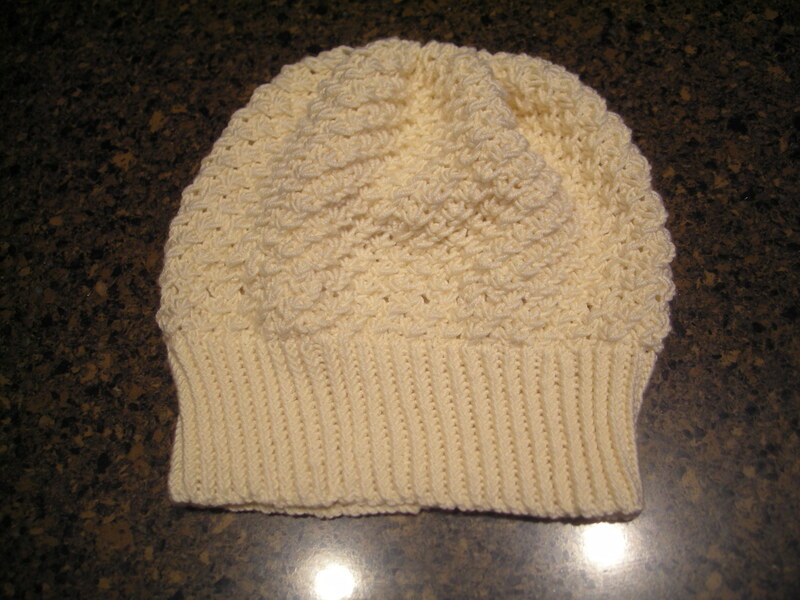 This is the Hinagiku hat, a freebie on ravelry (link), made in Heirloom Cashmino DK. I just bought a winter coat, a puffy hooded parka in a black and white plaid, and none of my existing hats look passable with it. They’re all too colorful — stranded brioche, fair isle, variegated, etc. They clash with the plaid. So I had these two little skeins of Cashmino, an incredibly soft cashmere/merino blend, and it seemed perfect for the hat. 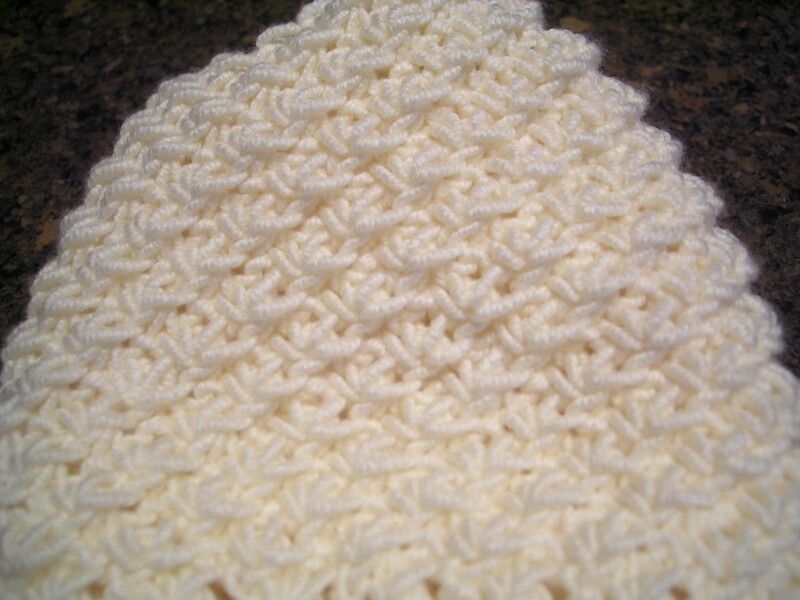 The pattern uses two stitches, a standard 1×1 twisted rib and a daisy stitch. 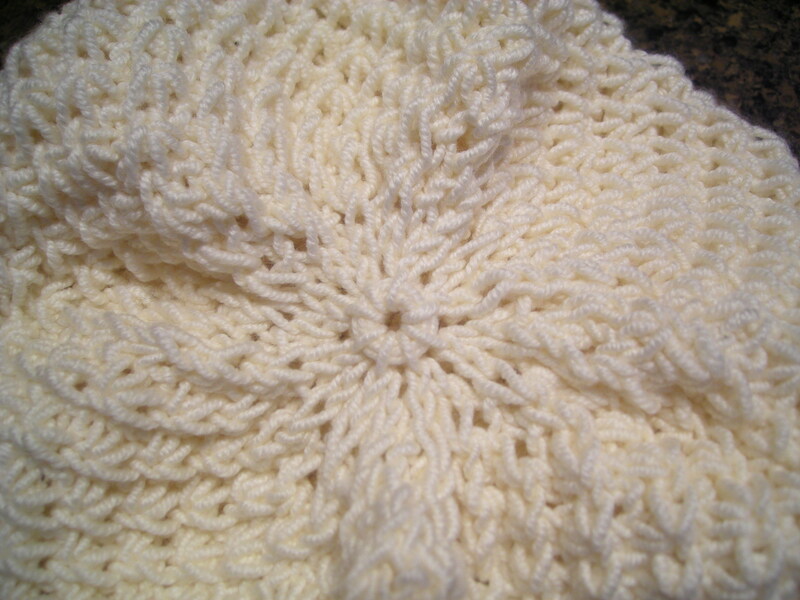 The daisy stitch is new to me. You k3tog and don’t remove the stitches from the left needle. Yarn over, then k3tog again through the same stitches — then you can slide the old stitches off the left needle Purl one, then repeat — it’s a 4-stitch pattern, 3 for the daisy and then a purl. There’s a resting row in between rows of this pattern (purl if it’s flat, knit if it’s round like this hat). The result looks a bit like a crocheted shell stitch. Here’s a close-up. Cute, right? And it really does resemble crochet. It’s a little hand-crampy because that third maneuver in the daisy — the second k3tog after the yo — can be a little fiddly. 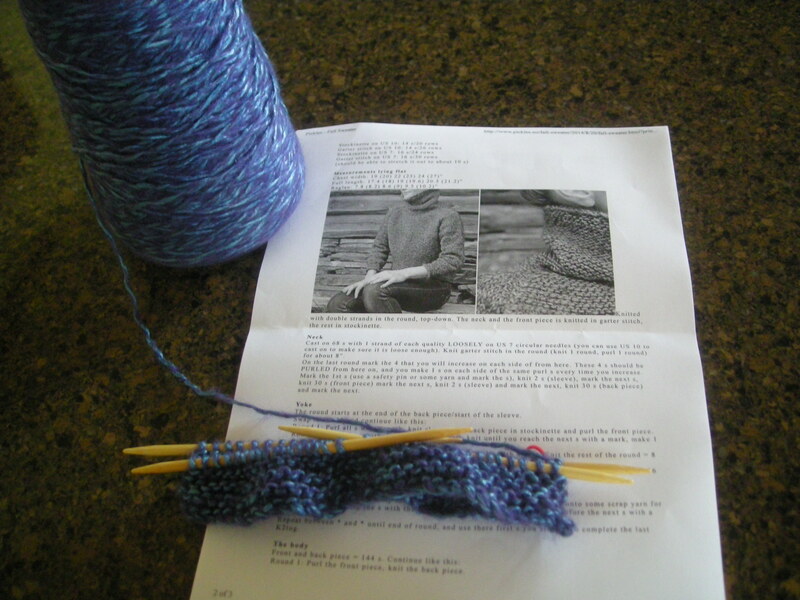 I would knit a few rounds, then switch to something else to rest my fingers. When I got to the top, where you have to draw the yarn through the live remaining stitches to close the circle at the crown, I decided to thread the yarn several times through the loop of those live stitches to create a slight button effect. I’ve done this on other brim-up hats before, and I just like this detail. It gives some weight and a cleaner finish to that final circle. In between turning my fingers into claws with that daisy stitch, I finished a footie and started the second footie. No second-sock-syndrome here! It’s good to have a bit of mindless knitting on hand — I always keep socks-in-progress in my bag, and so luckily, I had these when I was in the hospital for testing earlier this week. I’ve never regretted toting some knitting around with me, but there have been plenty of times I’m glad to have it! When I was in the hospital earlier this week, the nurses kept commenting on the socks I was wearing. They just happened to be some red variegated Opal socks in my standard 2×2 ribbed leg and foot — the sock pattern I almost always make because the fit is so good. In any case, one of the nurses was impressed enough with the idea of socks that don’t fall down inside your shoes — and that keep your feet warm! imagine! — that she told me she’s going to learn to knit now, too. Some people say they want to learn and you know they don’t mean it. This woman meant it. Another convert to the fold! I also finished the “skirt” (hip to hem portion), waist shaping, and belt loops on the Montera jacket. I’m nearly finished with the third ball of yarn, out of an estimated 5.5 needed, so we’re past the halfway mark on this project. The skirt portion is so wide, over 60″ hem circumference, that it is difficult to photograph it flat. I had to turn under the portion on the right from the side seam to the front band. Here’s a close-up of some of the belt loops. You had to knit each section between the loops separately, and that’s a lot of ends to weave. Unblocked knitting always looks so raw! 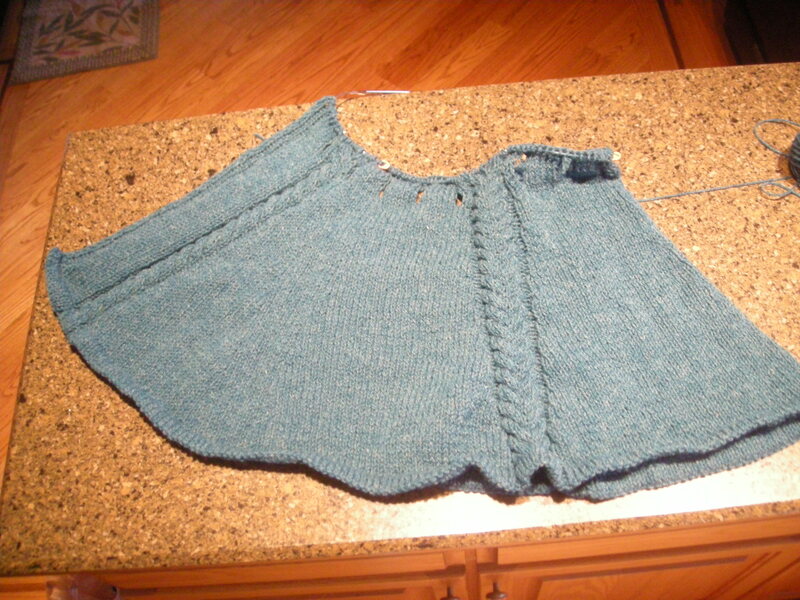 The next section of this sweater requires you to track multiple details at once — above-the-waist increases, bust shaping, buttonholes, and cabling. My brain is foggy enough that I don’t want to risk trying that without a chart, so I’ll be charting out these maneuvers before I take this project any further. Better safe than sorry. 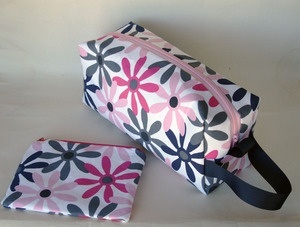 I also have several sewing projects on the go, and two of them are near completion. Three, actually, now that I think about it. But I’ll save those for FO reports later this week. If you knit, what are you knitting now? 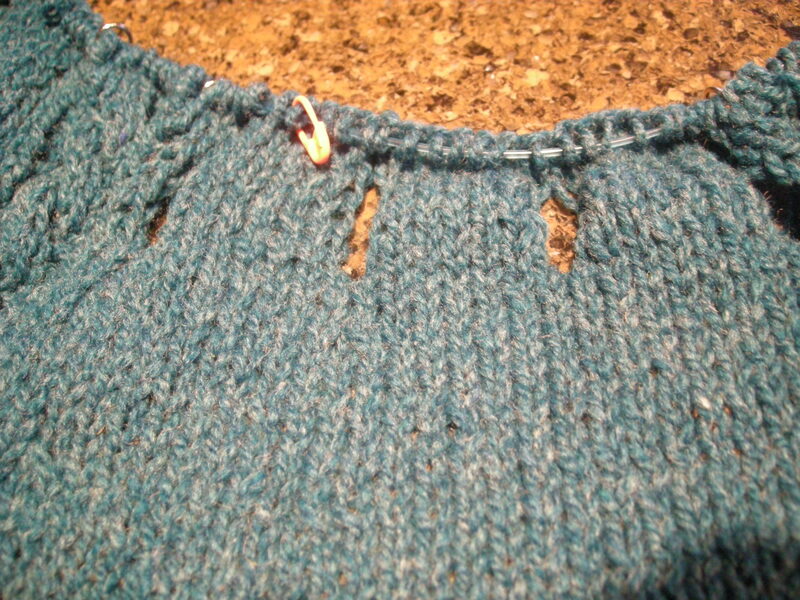 Yesterday, I finished the knitting for my Dark Pearl cardigan and wove in the ends. It still needs to be overdyed and blocked, and it needs buttons, but this one is basically done. 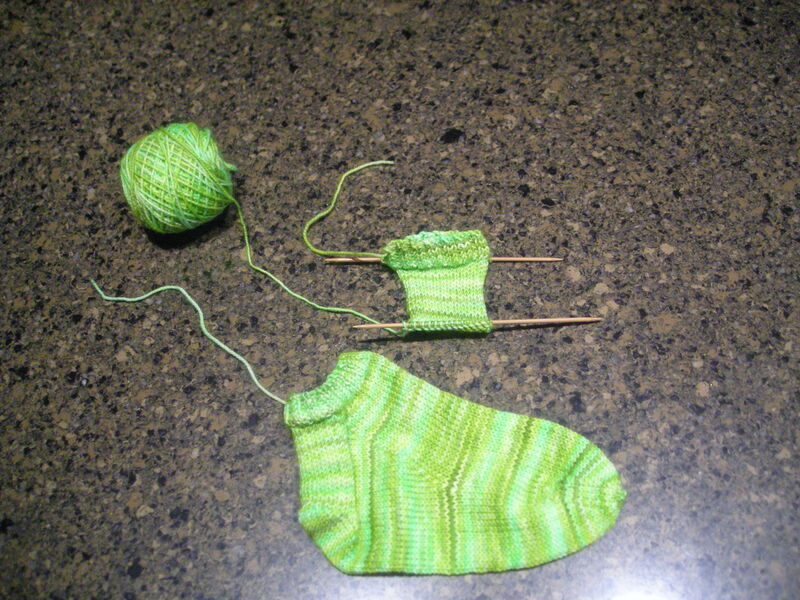 I cast on a pair of footies in this amazing chartreuse Another Crafty Girl sock yarn. The color is so bright that it’s hard to capture accurately, but this is pretty close — semisolid and almost blinding. 🙂 This will be my handbag project, the thing I knit when I’m out and about and need to keep my hands occupied. And then I cast on the Pickles sweater in this luscious silk-mohair from Artfibers. I’ve been guarding this yarn for a few years, waiting for the right project to pop up, and this is it. This stuff is as soft as a cloud, very lightweight for a bulky, and almost mesmerizing in the way the silk and mohair shades play off each other. I’ve barely started to knit the collar on this, but I’m already in deep love here. The lighter color is the silk, and the darker color is the mohair. The way the light shines on the silk through the mohair is beyond lovely. I have a feeling this is going to be one of those special sweaters that I save for events and days when I need a pick-me-up. It’s pretty magical so far. I do still need to knit sleeves on the green Stoker cowl sweater, but that requires me to think through some details on the sleeve shaping — because, as so often happens with my knitting, I’ve decided to veer off the pattern and do something a little different with the sleeves. This requires some math, and my head has just not been feeling very mathy lately, so it will have to wait. In the personal news department, some of you know that my dad has been staying here this year as he goes through treatments for stage four lymphoma. It’s been going very well, as these things go — he’s sick as anything from the treatments, but he’s beating the cancer. Today at the cancer center, they decided to skip the chemo this time. They wanted to give his body a chance to bounce back from some of the side effects. I take this as very good news. If he needed the chemo, I’m sure they would give it to him. It’s too big a risk to skip it if they aren’t sure they can get away with it. So I think maybe the end is within sight. We’re all feeling a bit brighter today as a result. It’s a pretty common trait among knitters. We tend to carry knitting with us for those stray moments that might otherwise be lost time. 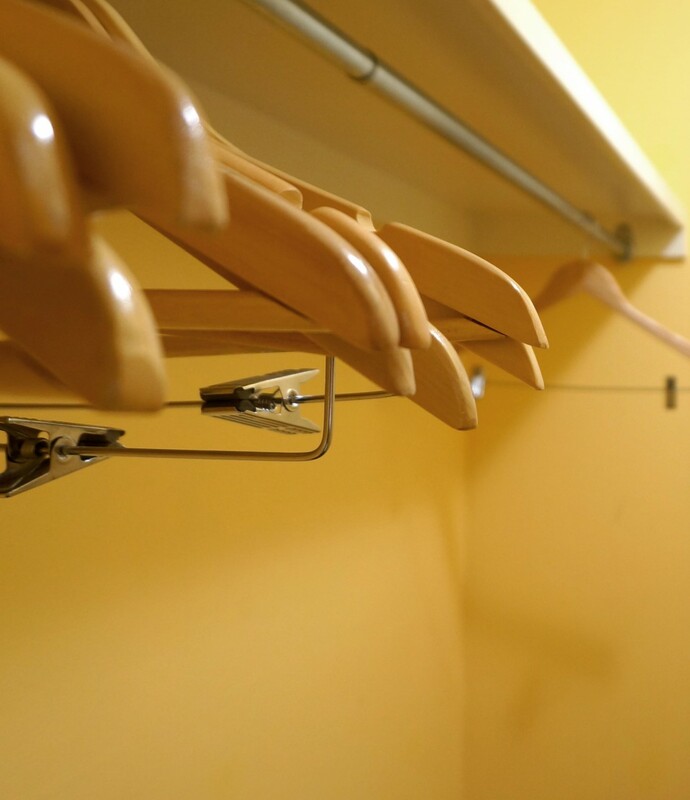 In my handbag, tucked in with the lippies and sunglasses and tiny notebooks, I usually have a small Piddleloop bag containing a sock-in-progress. I’d heard through the grapevine that Piddleloop was closing, but their etsy shop is still there. I hope this rumor is false because these bags are terrific — sturdy, pretty, well-made, and I can assure you in absolute confidence that they hold up well to abuse. I’ve abused the crap out of mine. This is the box bag I’ve been stuffing into the wallet compartment of my purse lately. Pretty, isn’t she? When I’m wearing a cross-body bag, such as I do when wandering the Stitches marketplace or the Renegade craft fair, I use a caribiner to clip the bag through the black loop to the purse strap. Then I can walk and knit at the same time. This is when I knit my socks — I have my standard sock recipe memorized to the point that I don’t ever have to think twice about it. 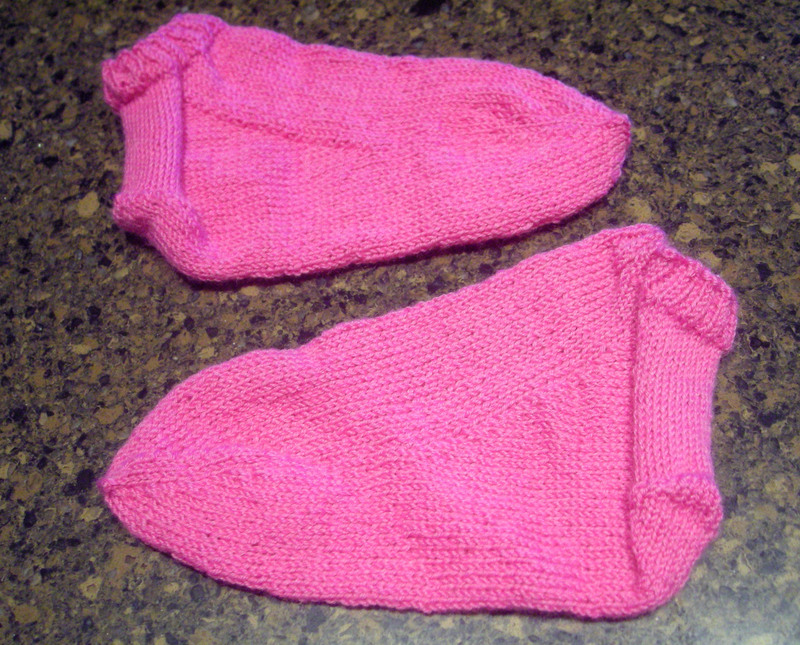 Lately, I’ve been knitting footies, which is just a standard sock without the leg. 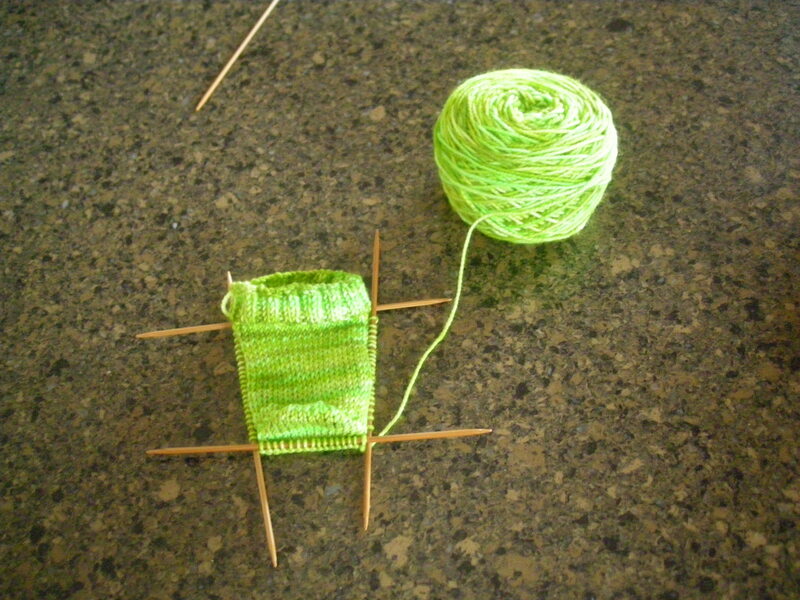 Cast on, knit six rounds of ribbing, then jump right into the heel flap. This is the result of walking around Midwest Fiber & Folk, Stitches, and random other stray knitting moments last month. I used to love wearing a casual twill or plain cotton skirt with a pair of Chucks or Keds. I still would love it, except that I had to get rid of all my casual twill and plain cotton skirts because none of them fit me anymore. Eventually, though, I’ll replace them with smaller (yay!) skirts, because that skirt/sneaker/tee combo is perfect for running around on a hot summer day. I don’t like bare feet inside sneakers, though, so I started making these little footies. They give a little rim of color around the very top of the shoe — not much, just a small slice of color — and keep my feet more comfortable. I almost didn’t post these finished footies here because they’re not really a garment, but then I thought, why not. I made them, after all, and not everyone gets to wear custom socks! These are made from Regia sock yarn purchased at The Fold’s New Year’s Day sale. This is one of my favorite sock yarns, a durable, color-fast, machine-washable and -dryable yarn that will still look fresh from the needles even after dozens of wearings. So even though these won’t go onto my me-made garments list for the year, what they heck, they’re still worth a mention. Which do you prefer on a hot summer day, skirts or shorts?